Butterfly lovers often want to attract them to their home using a garden. Learn which types of plants attract butterflies, and follow a few simple planting guidelines to establishing a butterfly haven in your own backyard. 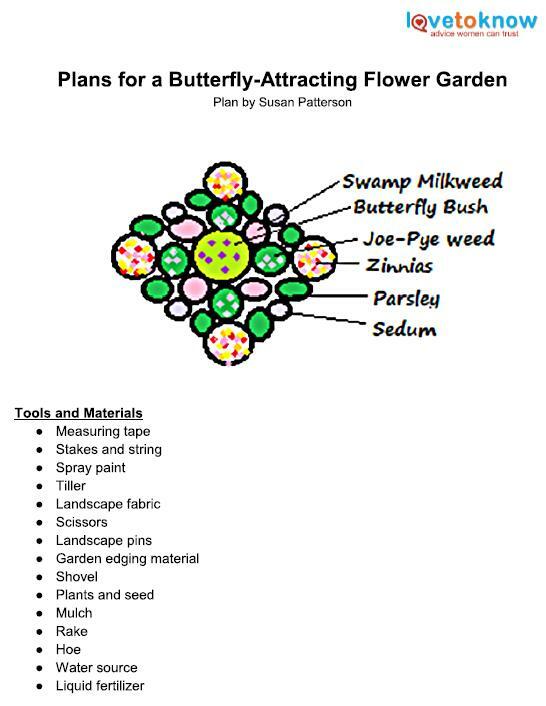 You can use the following information to create your own butterfly garden, or choose one of the plans listed for convenience. 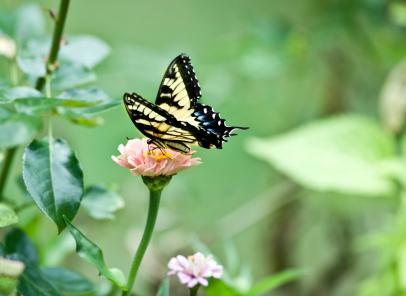 Choose a site for your butterfly garden that receives full sun, defined as six or more hours of direct sunlight daily. A little bit of late afternoon shade is fine, but most butterfly garden plants need bright sunlight. If you're adding plants to an existing bed, try to cluster butterfly-attracting plants together. This provides a variety of places for butterflies to feed. If you're creating a new garden, select a spot that's easy to see from a porch, deck or window so you can enjoy the bright colors and antics of visiting butterflies. Group plants together in clusters of three or other odd numbers. This looks more natural from a distance. Clustering flowers together by color, such as all red or orange blossoms together also forms a more cohesive look. If planting a flower bed along a fixed object such as a wall, be sure to place tall plants, such as the butterfly bush, at the rear of the garden and shorter plants near the front. Nectar plants provide butterflies with food. Different species of butterflies feed upon different plants, so have a variety of flowers for them to choose from to attract the widest range of butterflies. 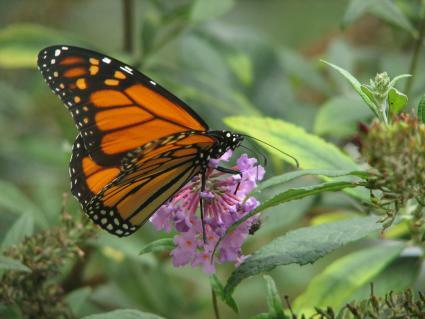 Nectar plants may be shrubs such as buddleia, also known as the butterfly bush, which attracts many different types of butterflies throughout the growing season. 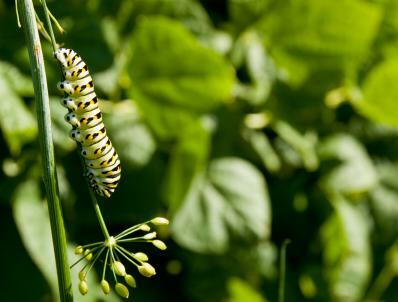 Host plants provide emerging butterfly caterpillars with nutrition needed to go into the pupae state and to transform into a butterfly. Expect these plants to look ragged, since the caterpillars chomp on them and eat entire leaves! If the plant recovers, it makes a nice addition to the garden. Accessories aren't mandatory in the butterfly garden, but they can add a nice touch. A little mud puddle or a shallow pool with rocks or mud on the bottom provides water for the butterflies. Butterflies also perch on moist rocks to extract minerals, so having a few different rocks in the bath or pool is helpful to them. Birdbaths can also serve as good butterfly garden accessories. A few extra large rocks provide more perching and sunning spots for butterflies. If you need help downloading the printable layout, check out these helpful tips. Plant the butterfly bush at the back of the garden. In front and slightly to the left of it, plant the three salvia, leaving about a foot between each plant. Place the plants in a triangular formation. Next, plant the echinacea to the right and slightly in front of the butterfly bush, also leaving plenty of space between them and placing the plants in a triangle formation. Scratch out a triangle in the dirt and plant seeds according to package direction immediately in front of the perennials. Add rocks or a bird bath for a nice little butterfly garden. You can leave it all to chance, or you can try planting the right kind of plant to attract the type of butterfly you want to see. Lantana is a large flowering perennial that produces blooms in varying shades of red, orange, yellow, and white. The nectar attracts Great Swallowtail butterflies. Zinnia is an easy to grow annual that produces every color except blue. 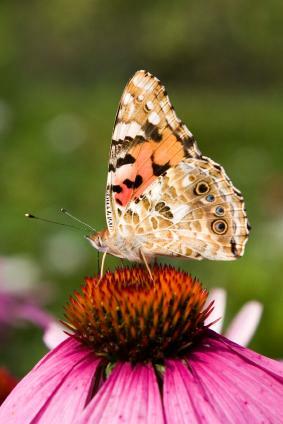 The nectar attracts the Painted Lady butterfly. Milkweed is a perennial plant that, while not especially pretty, does attract most all butterflies. 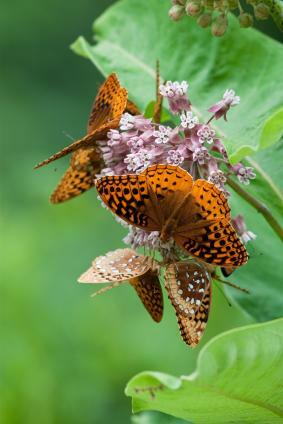 Usually sporting small, highly fragrant purple flowers, the milkweed is worth planting in your butterfly garden. Some of the butterflies attracted to the milkweed nectar are Monarchs, Mourning Cloak, Tiger Swallowtail, and Viceroy. Butterfly bush gets its name because butterflies are highly attracted to its fragrant flowers. Comma, Monarch, Mourning Cloak, Painted Lady, Red Admiral, and Tiger Swallowtail are all drawn to the butterfly bush. Snapdragons are used by the Buckeye butterfly to lay eggs. Grow them on the edge of your butterfly garden to encourage the adult butterflies to remain. Violets attract the Great Spangled Fritillary to lay eggs and this type of butterfly later feeds on milkweed. Consider growing violets early in the season. Elm trees attract Comma, Mourning Cloak while Willows attract Viceroy. The Monarch lays eggs as well as feeds off the nectar of milkweed. Now that you've got a basic idea of what's needed to create a butterfly garden, the following sources of plans can help. Better Homes and Gardens offers a free plan online, complete with color sketch and shopping list to guide you. The University of Minnesota Extension also offers a nice garden plan. The average backyard gardener may find this an easy plan to alter to fit their yard space, too. For butterfly gardens in Texas and the southwestern states, check out the Texas Extension Office. Dundee Nursery offers a handy diagram and coordinated plant list to create an L-shaped butterfly garden. It takes some work to create a butterfly garden, and the larger your layout, the more labor required to complete it. Even so, the major work is done once your perennials are planted. After that, all you have to do is replenish your annuals each spring, sit back, and watch those winged beauties make your garden their new home.